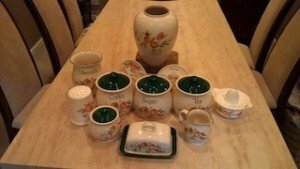 A set of three white ceramic tea, coffee and sugar canisters, each decorated with a fruit and leaf pattern. 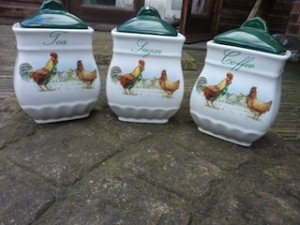 A set of three white and green ceramic hen and chicken decorated tea, coffee and sugar canisters. 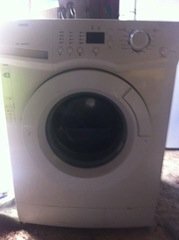 A white Zanussi 1400 spin 6Kg capacity under counter washing machine. 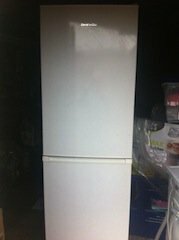 A tall standing white Daewoo frost free fridge freezer. 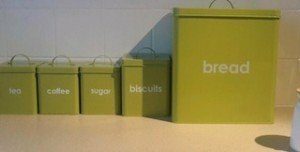 A set of lime green square metal kitchen canisters, includes a bread bin, a biscuit barrel and tea, coffee and sugar canisters. 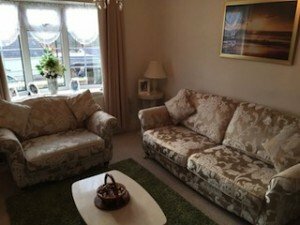 A vintage style two seater high back sofa and matching large armchair, upholstered in champagne and cream damask satin, on brass feet, together with a large green shaggy rug and a coffee table. 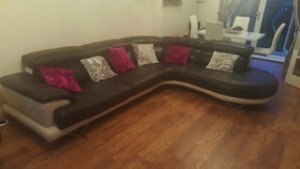 A large five seater corner sofa on chrome triangular legs, upholstered in black and white faux leather. 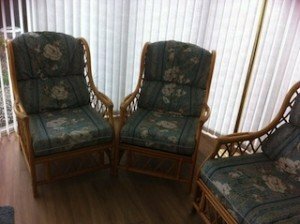 A two seater high back cane conservatory sofa and two matching armchairs, upholstered to the removable seats in floral patterned cotton. 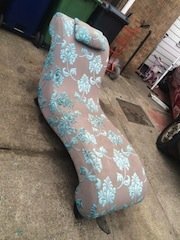 A modern large curved chaise lounge chair on wooden feet, upholstered in cream and duck egg floral patterned fabric. 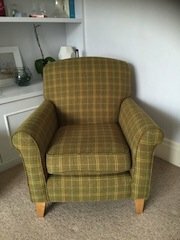 A large gentleman’s high back armchair on solid wood legs, upholstered in green and yellow tartan fabric. 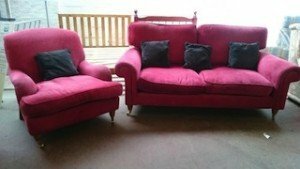 A two seater high back sofa and matching armchair on brass castors, upholstered in red cotton, together with black throw cushions. A three piece vintage sofa suite, includes a three seater high back sofa and two matching armchairs on mahogany and brass legs. 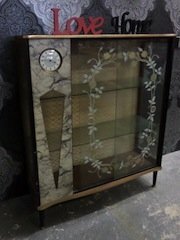 A vintage solid wood glass inlaid display cabinet, decorated with a hand painted floral garland with an built in clock. 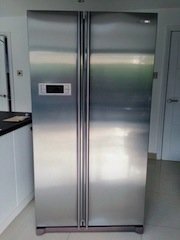 A tall standing Samsung American style frost free stainless steel fridge freezer. 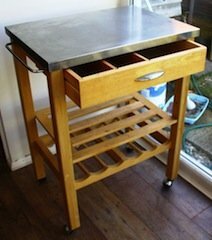 A solid pine stainless steel topped kitchen block on castors, having a cutlery drawer above a shelf and wine rack. 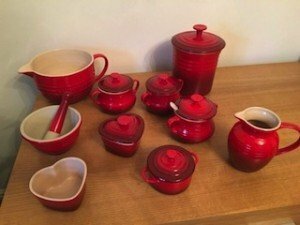 A large red and cream enamelled Le Creuset kitchen accessory set, includes two jugs, a lidded sugar bowl with spoon, two lidded soup bowls etc. 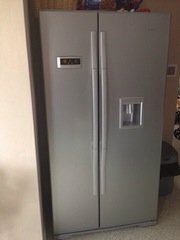 A tall standing Beko silver frost free American style fridge freezer, with a built in water dispenser. 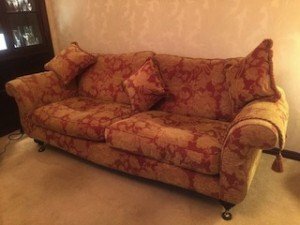 A late two seater high back vintage sofa on brass feet, upholstered in terracotta damask patterned fabric. 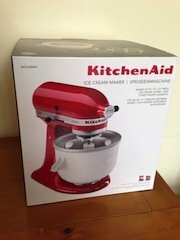 A brand new boxed metallic red and stainless steel KitchenAid ice cream maker. 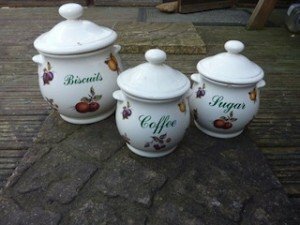 A collection of vintage fruit patterned ceramic kitchen accessories, to include a vase, a butter dish, a utensil holder, tea, coffee and sugar canisters etc.